Tattoo…. Absolutely. Given the right Territory. Do you have a tattoo? If so, what’s the story behind your ink? If you don’t have a tattoo, what might you consider getting emblazoned permanently on your skin? 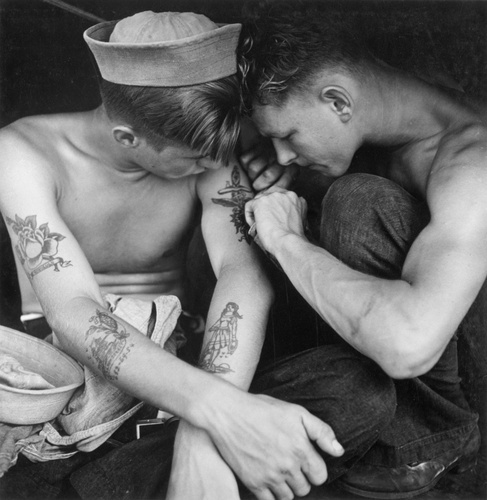 After all, tattoos and Asian are synonymous…at least in the Navy. What kept sailors’ hats on in the 1940s?? I do (I was in the Navy, and stationed in Asia), and it all started right here in Okinawa in 2004. But when I started to research and write a blog about the story behind my inked permanence, and while trying to find that just right perfectly crazy connection to Japan, I came across a topic that, well, had to be broken out as a stand-alone conversation: Zettai Ryouiki Koukoku. Thigh Advertising. Genius or demeaning?? Both!! Let me get this straight: my tat is not for advertising, nor really even for daily public consumption (given its placement). However, use of tats for advertising was very recently proposed, and not just by a liberal-leaning and progressive marketing company (are there any other kinds? 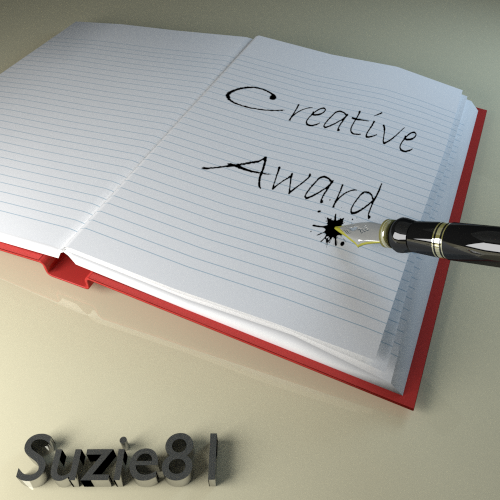 A rhetorical question for a certain mother-in-law in the advertising industry…. ), but by The Okinawa Convention and Visitors Bureau (OCVB) along with the Okinawan Prefectural government. Seriously. 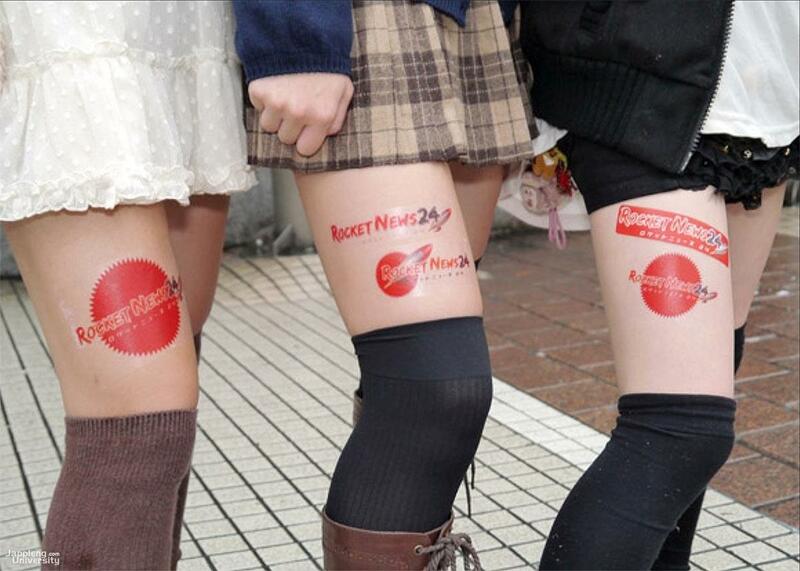 With “thigh advertising,” a new method of marketing gaining traction in Japan, young ladies wearing miniskirts or short shorts parade around town with promotional stickers placed on their zettai ryouiki or absolute territory. 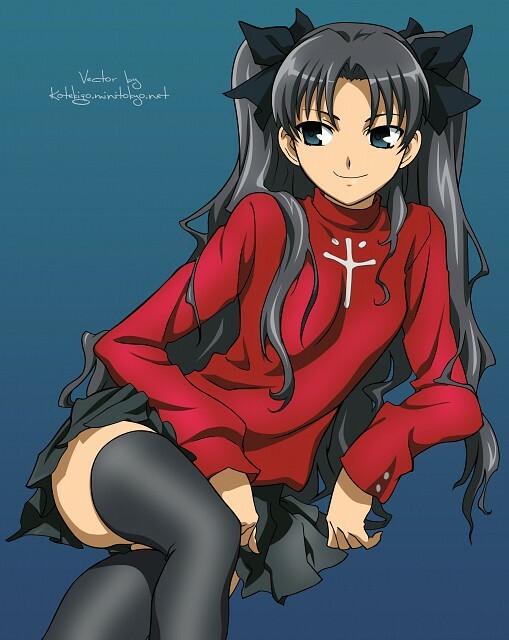 Zettai Ryōiki (絶対領域) (or Ryouiki as alternate spelling) loosely translates into “absolute territory” and is the area of bare skin seen between a skirt and thigh-highs or socks, a strategic body location that’s often fetishized in Japanese anime and manga. 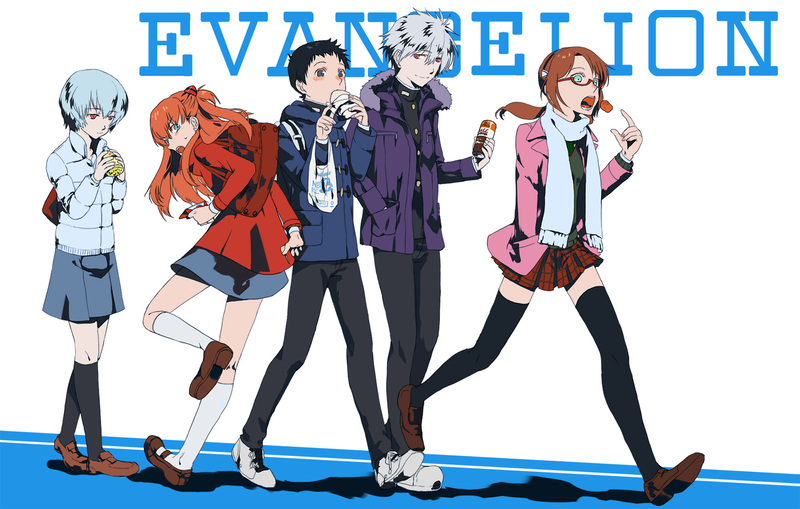 The idea of “Absolute Territory” comes from the anime Neon Genesis Evangelion, which initially referred to an “AT Field,” or, a nearly impenetrable barrier (force-field) generated by Angels and Evangelions – in essence, an inviolable area created God. Can you spot the AT Field?? However, at the time, a popular Chatterbot (known throughout Japan as Jinkou Munou, literally Artificial Intelligence without Intelligence) was noted for eccentric anime character design. Unveiling its newest character creation Mayura, imagined to be dressed in a black turtleneck, a grey checkered miniskirt, and black over-the-knee-socks and boots, the bot proclaimed, “The distance between the knee socks and miniskirt is invincible! I can even say that it’s God’s Absolute Territory.” Thus, while “absolute” in this context hints at the idea of “inviolable sanctuary,” there was also an almost direct and immediate tie-in with Neon Genesis Evangelion. And, as a mathlete, I was tickled pink to find that this segment of weird fetish in Japan has its own “Divine Ratio,” akin to the one of the same name found repeated in nature and art over and over again, strongly related to the idea of God’s Territory. Some have suggested that the ideal “Divine Ratio” is 4:1:2.5, referring to Miniskirt Length to Exposed Thigh (Absolute Territory) to Thigh-High Length above the Knee. Oh, and it seems that the acceptable margin of error is ±15％. Someone has really thought this through…. Unfortunately for him, he’s most likely destined to never touch a woman’s thigh on account of all the weirdness. Please, no math in my fetish. Given that mathematical ideal, it’s only perfectly normal to think that there should be a grading scale by which to judge the quality of Absolute Territory. And there is. Which is roughly as follows (although these too have recommended absolute distances associated with them): Grade A – Thigh high socks, thigh-highs or stockings; Grade B – Over-the-knee sock; Grade C – High socks; Grade D – Three quarter socks; and Grade E – Crew socks. Ankle socks are an instant Grade F. Only the top two Grades (A & B) are considered true zettai ryouiki and are only properly achievable by females. Thank goodness. Interestingly enough, there appears to be also a most coveted Grade S (wonder what that stands for) that can be reached only from Grade A, and with the addition of two other critical elements: 1) Twintails hairstyle, more commonly perhaps known as pig-tails; and 2) a Tsundere personality. What is the latter you ask? Good question. 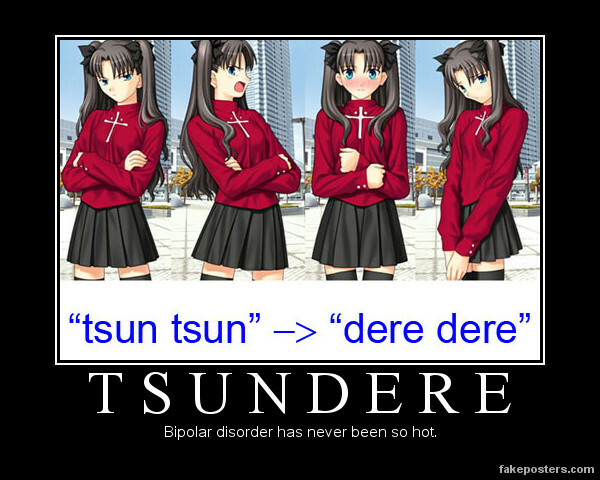 Tsundere (ツンデレ, pronounced tsɯndeɽe) is a portmanteau of two Japanese phrases: “tsun tsun” (ツンツン), which is to turn away in disgust, and “dere dere” (デレデレ), meaning to become something akin to “lovey-dovey.” The term refers to characters who act under a mask of indifference, dislike, or even open hostility to the object of their affections, but secretly (or not-so-secretly) harbor feelings for them. A tsunderekko is a tsundere female; more rarely you may see tsunderekun for a tsundere male. 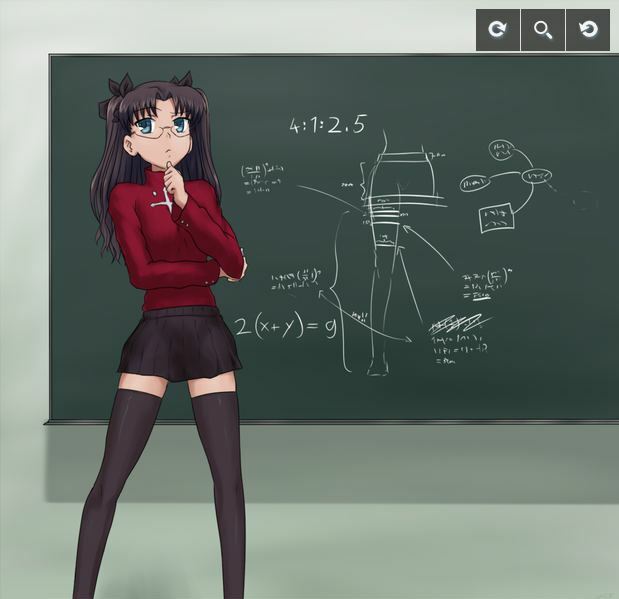 Two prime examples of Grade S Absolute Territory include Rin Tohsaka and Hiiragi Kagami. So, in an attempt to cash in on this craze, a Japanese marketing firm is launching zettai ryouiki koukoku, or “absolute territory PR”. There are three criteria for prospective thigh flashers: 1) you must be a female; 2) you must be over 18; and 3) you must have over 20 “connections” on your social networking site, whether that’s Facebook, Twitter, or something similar. 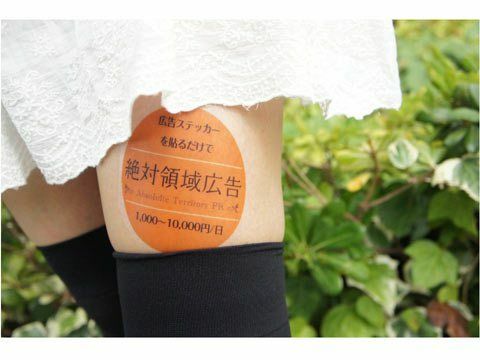 It’s a one day gig, during which you’ll wear a sticker on your thigh, and participants will get paid between ¥1,000 and ¥10,000 (roughly $10 to $100USD). You’ll need to be photographed in at least two different locations and then upload those photos on a social networking site. So, in a sense, it’s not about advertising live in public, but using the idea of drawing eyes to Absolute Territory in public that makes this so…alluring. 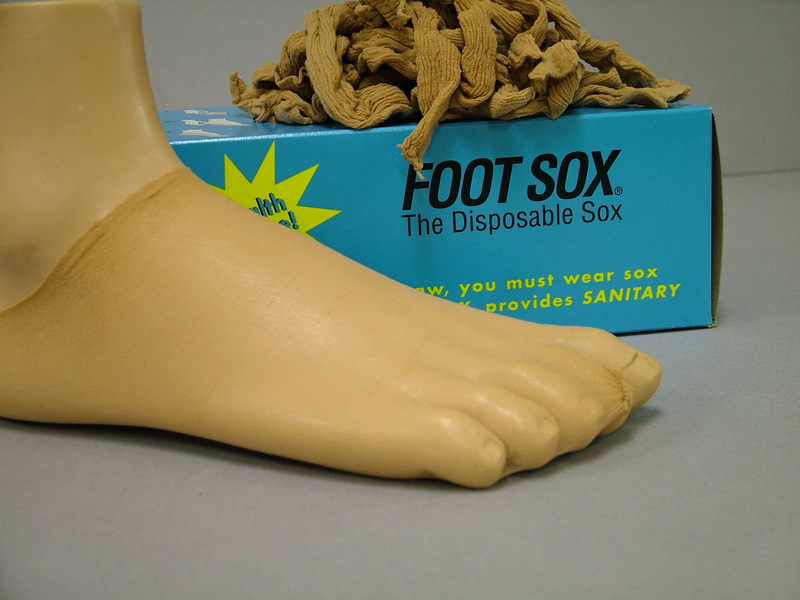 From what I can find online there is no shortage of applicants (これはつい見ちゃう自信アリ！ 絶対領域に貼りつける広告ステッカー「絶対領域広告 Absolute Territory PR, Kotaku Japan). From the PR Firm’s Website…. Really, we are supposed to read stuff posted *there*?? Talk about a Tsundere attitude. Now, if only the OCVB uniform consisted of twintails and thigh-highs…but there’s little doubt their disposable Foot Sox dooms the government to Grade F, perhaps fitting for this epic failure. This entry was posted in Family & Friends, Okinawa Living and tagged absolute territory, adventure, Anime, art, Asia, ink, japan, manga, Okinawa, Ryukyu Islands, tat, tats, tattoo. Bookmark the permalink. I quite enjoyed this! Thank you for sharing. I was just searching for other people who had recently written about a tattoo as well. Faith, I’m glad you liked the post. Stay tuned, I plan to get around to my original plan of writing about my own ink and how it’s changed over the years. This strange PR campaign in Japan, intended as just a tangent in my story, took on a life of its own. Do you see thigh-highs catching on where you are?